North America's flu season has been slow in getting started, but yesterday's unexpected CDC HAN Advisory on Severe Influenza reminds us there is plenty of flu season left , and that seasonal flu is always unpredictable. As mentioned last week, unlike North America (see An Update On The Russian Influenza Epi Report), Eastern Europe and Russia have been reporting heavy flu activity for several weeks, with A(H1N1)pdm09 being the dominant strain. Igor Molchanov: "School of Saratov have to close for a week"
Influenza and ARI morbidity data. Influenza activity increased significantly on the week 04.2016. 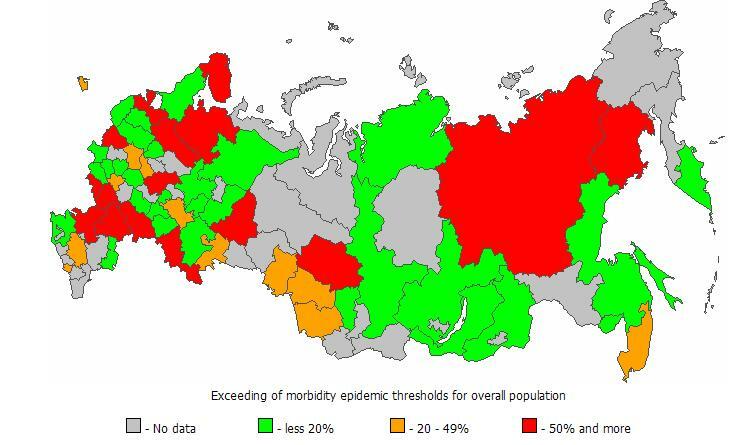 The nationwide ILI & ARI morbidity level (91.9 per 10 000 of population) exceeded the national baseline by 32.2%. Etiology of ILI & ARI morbidity. The overall proportion of respiratory samples positive for influenza in traditional surveillance system was estimated as 33.6%. Influenza A(H1N1)pdm09 dominated (91.9% of influenza cases). Influenza A(H3N2) and B cases registered sporadically. Percent of positive ARI cases of non-influenza etiology (PIV, adeno- and RSV) was estimated as 19.6% of investigated patients by IFA and 7.3% by PCR. In sentinel surveillance system clinical samples from 68 SARI and 60 ILI/ARI patients were investigated by rRT-PCR. 21 (30.8%) influenza A(H1N1)pdm09 cases among SARI patients and 10 (16.7%) influenza A(H1N1)pdm09 cases among ILI/ARI patients were detected. Antigenic characterization. 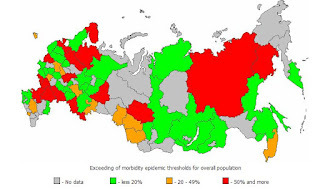 Totally 84 influenza A(H1N1)pdm09 and 2 influenza A(H3N2) viruses were characterizated antigenically in HI in two NICs of Russia since the beginning of the season. 43 (51.2%) influenza A(H1N1)pdm09 strains were related closely to influenza A/California/07/09 virus, 41 (48.8%) influenza A(H1N1)pdm09 viruses had decreased up to 1/8 - 1/16 titers in interaction with antiserum to this virus. Two A(H3N2) strains were similar to influenza A/Hong-Kong/4801/2014 virus, with antiserum to influenza A/Switzerland/9715293/2013 they reacted up to 1/4 - 1/8 of homological titer. Genetic characterization. 11 investigated influenza A(H1N1)pdm09 virus strains were A/South Africa/3626/2013-like. All viruses bear clade 6B specific mutations in HA (S84N, S162+N and I216T) and formed new genetic group according to phylogenetic analysis. One A(H1N1)pdm09 sequence obtained directly from autopsy sample showed the presence of additional mutation D222G in HA1. Nearly half of the samples tested (and the majority since January 1st) show reduced titers against the current vaccine strain. Most of the samples tested since January 1st fall into the emerging 6B subclade defined by HA1 amino acid substitutions S162N and I216T (see Influenza virus characterisation, Summary Europe, December 2015). The H1N1 vaccine strain used today is essentially the same one as was developed in 2009, while we've seen the H3N2 vaccine strain replaced numerous times over the past 7 years. It is inevitable that through the process of antigenic drift, the H1N1 strain will eventually acquire enough genetic changes to require an updated vaccine virus. But for that to happen, a biologically `fit', antigenically drifted virus must outperform the old virus and become dominant. And right now, it is too soon to know if these reduced titer viruses will fit that bill. It is, however, something to watch. The D222G (or D225G in influenza H3 numbering) mutation mentioned above is not new. We saw it described as early as the summer of 2009, but it really came to prominence in the fall of that year when scientists in Norway linked it to deeper lung infections and greater virulence. This relatively rare amino acid substitution at position 222 (225 using H3 Numbering) from aspartic acid (D) to glycine (G) allows the virus to bind to receptors found deeper in the lungs, and is linked to the development of more severe pneumonia. In 2013, in EuroSurveillance: Revisiting The D222G Mutation In A/H1N1pdm09, we saw a study that suggested this mutation may actually degrade H1N1's transmissibility, and that most of the time this variant comes about through a spontaneous mutation in the host after the host has been infected. D222G's rarity, showing up in only 1%-2% of isolates tested, has kept this mutation from being a major public health concern (Cite). Despite a regional decline in influenza A(H1N1)pdm09 virus infections during 2013–14, cases at a Florida hospital were more severe than those during 2009–10. Examined strains had a hemagglutinin polymorphism associated with enhanced binding to lower respiratory tract receptors. Genetic changes in this virus must be monitored to predict the effect of future pandemic viruses. This is all very interesting from virological standpoint, but its significance beyond Russia's current outbreak remains unclear. New influenza clades, subclades and variants continually emerge, and most fail to thrive, or are quickly overrun by other, more successful strains. We'll have to wait to see if these clade 6B mutations are winners or losers in influenza's evolutionary lottery. But with the selection of next fall's seasonal flu vaccine components only a few weeks away, influenza scientists are undoubtedly taking a hard look at the recent rise of clade 6B H1N1 viruses as they try to devine influenza's future.